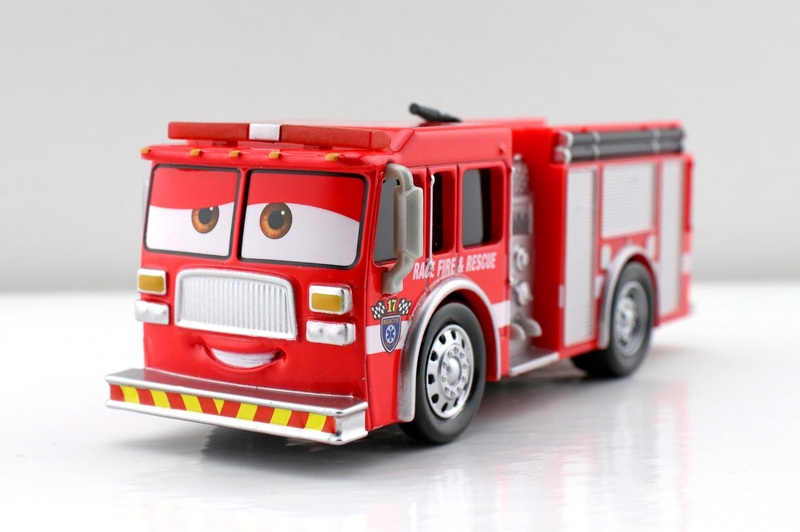 Hello again Disney·Pixar Cars collectors for another Cars 3 Mattel 1:55 scale diecast review! Today's diecast, once again, dates all the way back to May 1st last year... here we have Tiny Lugsworth! 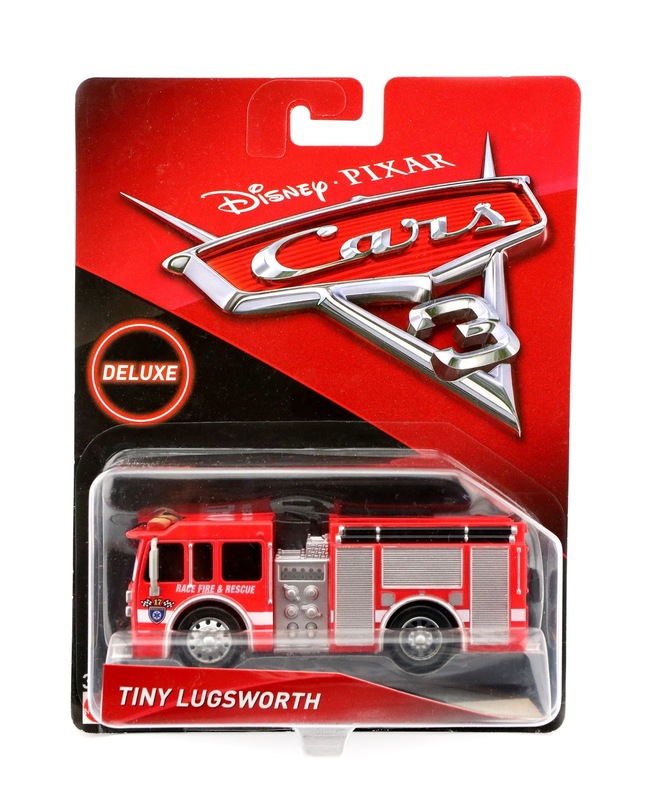 Tiny was included in the very first case (case A) of Cars 3 diecasts last year and, despite being a cool looking Deluxe size firetruck, can STILL be found on store shelves today. One of the factors contributing to the sad truth that this one is still hanging around on pegs (besides the fact that Mattel just shipped way too much of case A to retailers) is that this character is barely seen on screen in the film. He's another character you'll miss if you blink (as shown in the screen shot above, he doesn't even come into frame until McQueen's crash scene begins fading to black—I even had to brighten that picture up quite a bit to see him better). 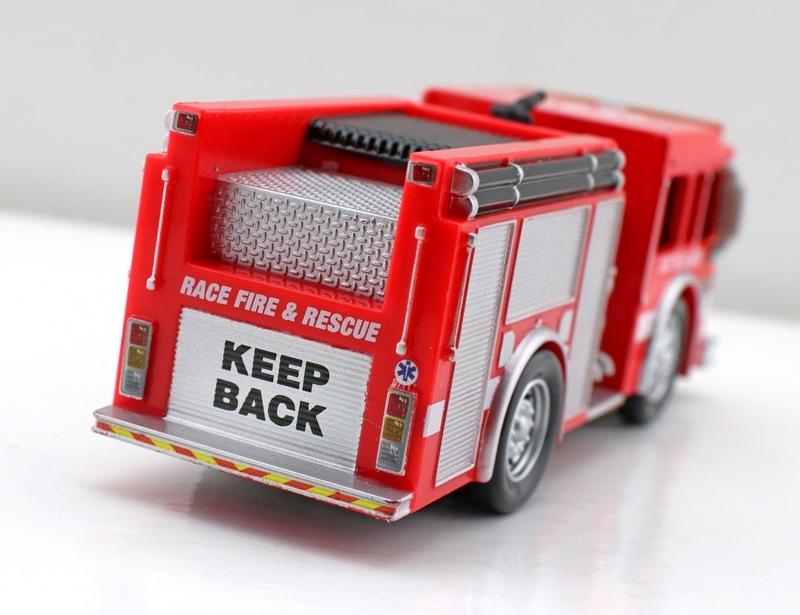 Kids usually love these types of fire and rescue vehicles though (regardless of screen time), so maybe, as mentioned, there were just too many of them produced. Either way, the good news is that there's still a chance to find him if you haven't picked this one up yet! Here's a good look out at Tiny out of the package. He's a really decent size (measures about 5" long, far from being "tiny" ;) and has all those great details and graphics you've come to expect from Mattel. Unfortunately, like with a lot of the bigger vehicles in this line, only the front cab portion is actually diecast metal. The rest of him is plastic. I do find it a little odd that he's got such a happy expression (due to the nature of the scene, maybe it would have made sense for him to look a little more concerned? ), but that's just a nitpick. Head to your local Walmart, Target or Toys R Us and chances are you'll be able to find this one! If not, I've included an Amazon link below. Happy hunting and be sure to let me know your thoughts in the comments.